The thought of Adam Ferguson generated great excitement among many of his philosophic contemporaries in the late eighteenth century, and it continues to inspire the modern reader. This major study by David Kettler is an ideal introduction to Ferguson's life and thought. 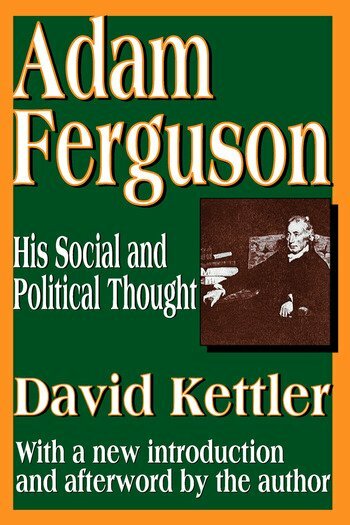 The new introduction to this first paperback edition discusses Ferguson's work in relation to his better-known contemporaries David Hume and Adam Smith, while the afterword offers an in-depth reconsideration of Ferguson's most renowned work, An Essay on the History of Civil Society, with emphasis on present-day disputes about the concept of civil society. Ferguson welcomed the advent of critical and analytical philosophy as an ally against superstitious credulity and confused obscurantism, but he was afraid that it might also dissolve into incomprehensible technical complexity and ethical relativism. He was attracted by the manifest practical accomplishments of modern science, as well as by its masterful ordering of natural phenomena into a unified theoretical structure, but he feared that its adherents would debase the notion of man to that of a machine at the mercy of mechanical forces. Ferguson thought well of ambition, but he also believed that a frenzy of ambition and frustration might tear at man's self-respect and peace of mind. The decisive phenomenon manifested by Ferguson's writing is the emergence of an intellectual's point of view toward the conditions of modern society. Many of the questions that he posed have been restated in more profound ways, some of the questions and most of the answers have been eliminated or transformed beyond recognition; and all of the issues he raises are now expressed by others in harsh, new words. But, however formulated, Ferguson's concerns clearly foreshadow the problems of over-rationalization, dehumanization, atomization, alienation, and bureaucratization that have been repeatedly canvassed by intellectuals in our time.